Wagner Medizin- und Pharmatechnik is a fully trained and authorized service and sales provider for the ATS from EDC Biosystems throughout Europe. Wagner Medizin- und Pharmatechnik`s exceptional service history makes the company a valued partner for integration companies as well as end users looking for liquid handling needs and requirements. For sales and service in the US please contact our company Wagner Life Science. Wagner Medizin- und Pharmatechnik has non-exclusive rights to sell and service the instruments throughout Europe. What is True Non-contact Technology? 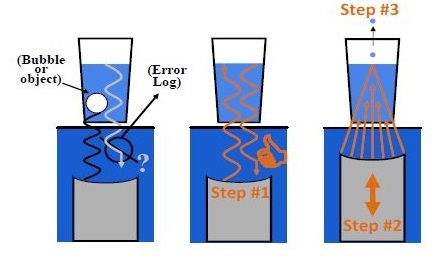 A means for transferring liquid from a source to a destination without the use of pins, tips, syringes or a capillary device. The transfer is direct, accurate, and extremely repeatable. The ATS Acoustic Liquid Dispenser transfers chemical and biological solutions with unparalleled accuracy and precision directly from one plate to another. The ATS is flexible, application friendly and is highly adaptable to meet a broad range of liquid handling needs and requirements. Using EDC Biosystems’ patented acoustic transfer process, you can perform your experiments with the lowest starting and dead volumes of any liquid handling device on the market. There are no print heads with fixed-spacing or volume-specific tip sizes to deal with, and no cross-contamination. The ATS easily integrates with other laboratory equipment for a complete automated solution. Small footprint, rapid installation, & setup, wide variety of plates, 1,0nl dispence, low deadvolume, low maintenance, easy to use! Higher Performance: The ATS can dispense from 96, 384, 1536 & 3456 wellplates. 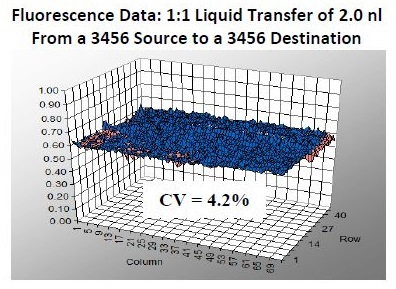 Transfer liquid from your choice of source plate into any destination substrate imaginable. Total liquid transfer volumes start as low as 1.0 nL. A wide range of liquids can be transferred by the ATS using any calibration available on the system. 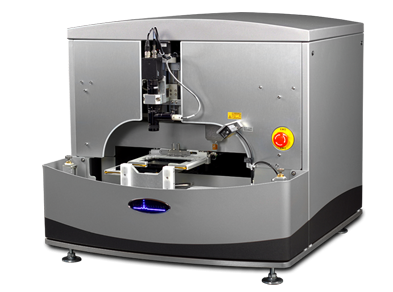 The ATS has a lower starting and dead volume than any other automated instrument, delivering high performance while conserving resources and reducing costs. The ATS is designed and built ready to handle any application requiring accurate and precise liquid transfers of ultra-low volumes. 2nl droplet dispenseDispensed 2 nl droplet landing onto a destination positioned upside-down and directly above the source well. 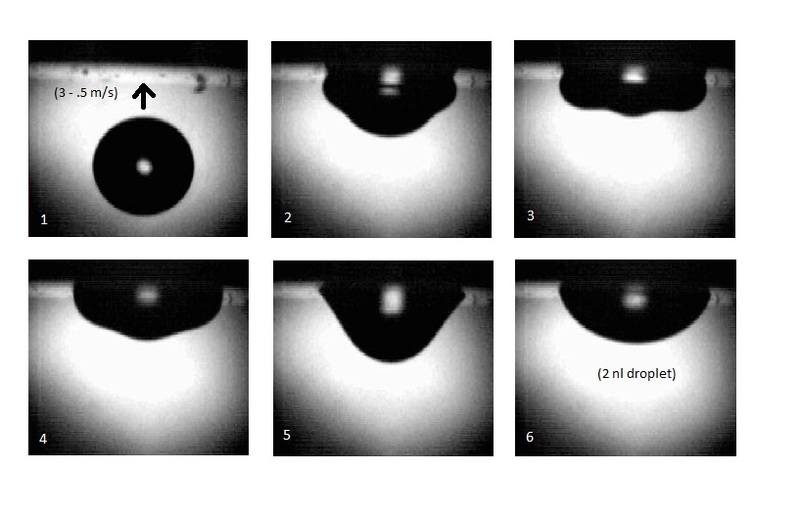 Regardless of high velocity at impact and orientation, the droplet does not disintegrate or fall due to the dominating effect of the liquid surface tension at this volume scale. The ATS utilizes real-time sensing and focus technology. Immediately before every dispense. A sensing pulse gathers information on the present acoustic path. Upon receiving a return signal (Step #1),the acoustic lens makes necessary adjustments (Step #2) and then fires the dispensing pulse (Step #3). This entire process takes less than 50 milliseconds. A key benefit of the ATS real-time dispensing process is its ability to reveal potential problems in the acoustic path. Errors are logged and the ATS moves onto the next dispense. Missed wells are identified and can be re-tried or excluded from the final analyses. 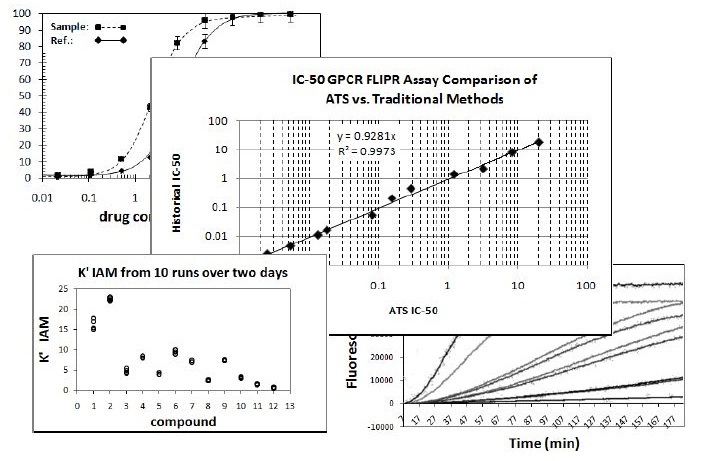 This greatly reduces the incidence of false-negatives in experiments.